So I finally got my 23 canopy express running, last time 15 years ago, and it sounded great. I warmed it up, and drove it around my house to get a feel for driving a T. I heard a clunk once or twice and thought something had come loose and hit the fan. When I pulled back into the barn and shut down the motor, I tried to restart and it was dead. What I thought was a dead battery turned out to be a stuck starter. 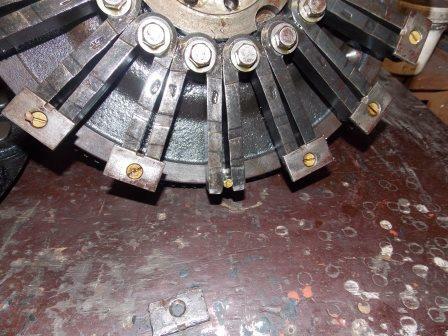 I removed the inspection cover on the Bendix and found a piece of metal jammed it to the Bendix gear. I was able to get it out and it turned out to be the mounting plate the holds one of the magnets. I also drained the oil and found thr screw head in the drain plug. Ed, unfortunately you're going to need to pull the engine. All the magnet screws will need to be replaced. Along with that, the mag will probably need replaced and the magnets recharged. While the engine is out, all other engine components need evaluated to such as rod and main condition and clearances, cylinder and piston condition cam, bearings and valves. You've entered a phase many of us have been through. The brass screws chrystallize with age and use so it's common for the heads to crack resulting in a loose magnet clamp plate. 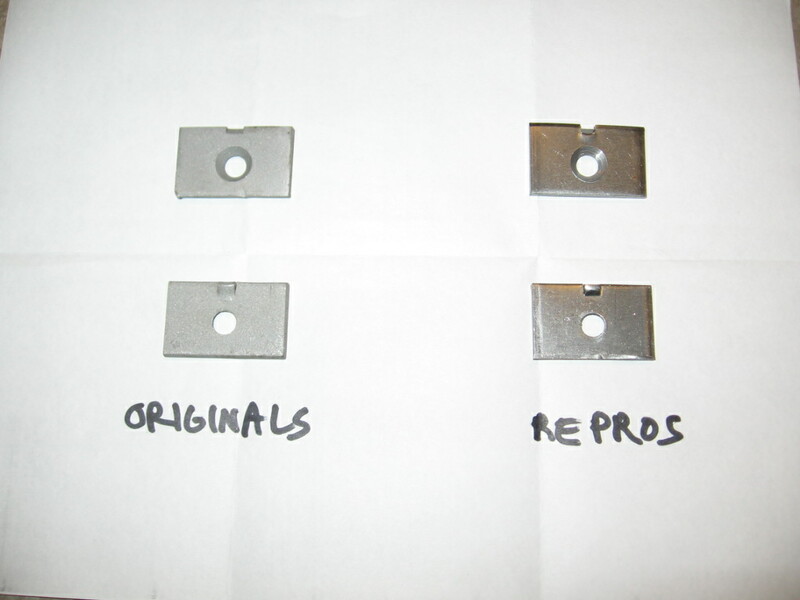 New screws are available from the vendors - but I've seen complaints about the repro clamp plates being too soft, so used originals are best there. The magnet is also held by a bolt, so it's not likely you have lost the magnet - but sometimes they do split at the V and crack the hogshead.. 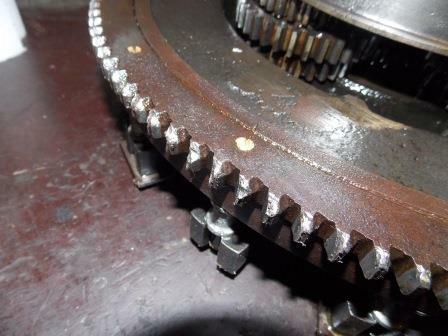 It may crack from metal fatigue if you continue to run the engine without claming on the magnet ends. 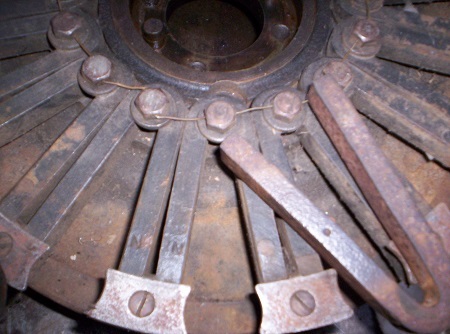 I think it's unlikely to find space between the magneto spools to remove/replace a clamp screw on a '23 engine? Some older magneto plates before the oval spools were introduced in 1914 had holes for replacement of screws. You'll have to take it down and replace all the brass screws, check the magnets and the spools (alu spools can crumble) and get a better safer engine in return. Thanks for the quick response. I kind of figured I would have to tear the engine down. I was hoping to at least get a few laps around my neighborhood before I broke it. Oh well now I have a winter project to look forward to. I have a rebuilt engine that came from the same estate as the express. Now I can drop that in and try it out. Thanks again. One additional point. If your engine has Aluminum magnet stand-off spools they should not be reused and replaced with new ones. If it has brass spools it is ok to reuse them. Ron you are absolutely correct don't ask me how I know. At first I saved over 30 dollars only cost me 350 dollars and three weeks wait to correct my 30 dollar savings. Don't step over a dollar to pick up a dime. I should do as Ron say change it all plates, screws and spools. Here a few photos of what could happen when you don't. The engine is from a 1924 touring. A screw broke, the driver heard a clung and didn't stop. Result in a rebuild magneto coil ring.I found the head of the screw in one of the band. Parts of the band were in the oil line funnel no out side oil line. Two rods melted, total rebuild was needed. Have you had any Lukken this year? 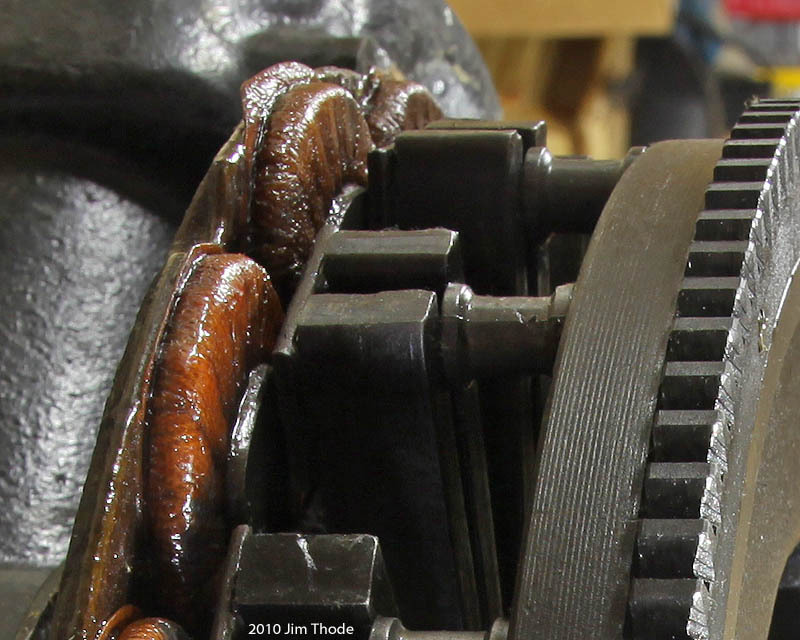 It could have been metal fatigue on the brass screws, or it could have been magnets too close to the magneto ring. As posted above, it will need to be removed to fix it and since from your post, it hasn't been driven for 15 years, do you know when it was last rebuilt? and what was done at the last rebuild? If you don't know the answers to the above questions, it would be best to go through the entire engine, transmission and magneto while it's out and repair or replace everything needing attention, and hopefully, you will not need to pull it again soon. I've had no luck with the new plates that the vendors sell, to soft and bend up at the ends when tightening the screw, so I use the good old originals. I agree, the reproduction magnet clamp plates are garbage and in my view should not be used. 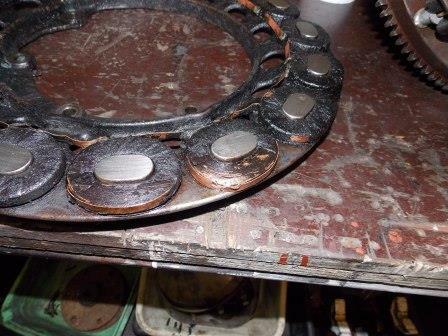 Rarely do you find original magnet clamp plates no usable. When I pull the motor, I do not see an easy way to remove the pedals like a model A. Should I remove the firewall to get it out? Ed, tilt the motor up to draw the peddles under the fire wall. It will drag out. I contacted Lang's and they confirmed that the magnet clamp plates they show on their website are the reproduction ones. However, they offer cleaned up original ones for $1.00 each if you call. It is likely that you will need only one replacement plate. But you will need to check everything while it is out. If I were doing the job, I would also check for broken magnets. You might need to replace one or more magnets. If you do need to replace magnets, they are of opposite polarity. The poles are arranged SS NN SS NN etc. So be sure to find the right magnets for the locations you replace. If you try to re- magnetize the magnets in opposite polarity, they won't remain charged for very long. Will the engine clear the steering box or dose that need to be removed first? Mark, thanks for the heads up on the plate at Langs. I plan on opening up the entire engine once I get it on the stand.Thanks for all the help. I will post if I find anything else. Ed, unbolt the steering column and pull it into the interior of the T as far as you can to get it out of the way. Do forget to unbolt the wishbone under the engine. Some I've come across have been marked, an N on the north pole or a dot on the north pole, but I have used magnets at random using the compass as you described David. 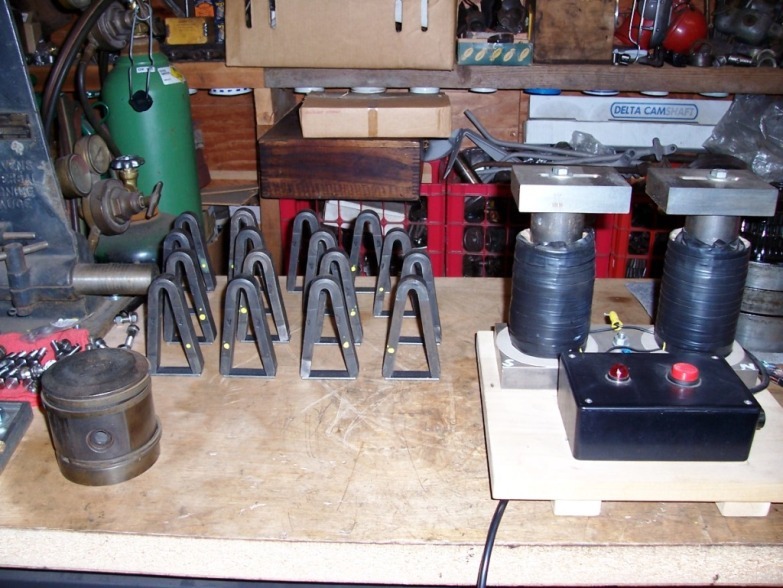 Frank van Ekeren's photo shows the clamp plates with curved sides. Are these what the originals look like? Mine was just a square side piece of stock steel with a beveled hole in the middle. Ed, those plates are early ones, 1911/on, there is variations on some others as well, 15/16 had a much wider one with 2 locating tags but your square ones are the most common ones. I have a set of original plates on the way from Lang's, they are listed on the invoice as "small" plates, I will post a picture of them when they arrive. The magnets that I have seen seem to have a front and back side. What I call the front side is lightly machined flat at the v end and also at the pole end. The club booklet "Electrical System" doesn't mention a front or back side. The black Ford Service manual says if one magnet is reverse polarity, turn it over. Most important things is to get the polarity right and the height from the flywheel right, so it might be OK to "flip one over". Norm this is most interesting I re-looked at my spare magnets and there appears to be an inside and outside. Some have a system of dimples with a large dimple and small dimple, in most cases the large dimple was N and the small dimple was S. However some didn't follow that pattern. Some had the dimples on the same side and some they alternated. Most had the "machined" areas on the face side but some didn't, some had Ford stamped and some didn't. It is possible that there were several magnet manufacturers. I hadn't noticed all the markings before, you learn something every day. Magnets were made for over 15 million cars over a period of 19 years, and probably some replacement magnets were made for a number of years after the last cars were made. I am not an expert on magnetos or magnets. I have only seen the magnets in the engines which I have worked on and some spares in a collection of parts which I have accumulated over the years. So it wouldn't surprise me that magnets differ from each other over the years. And who knows whether the magnets in any particular car running today were the original magnets installed at the factory? A somewhat related question - how and how hard should I strike my magnets to confirm that they aren't cracked prior to use? Just tap them on an anvil, like a tuning fork, or really whallop them? I give mine "a couple good taps" with a brass hammer. 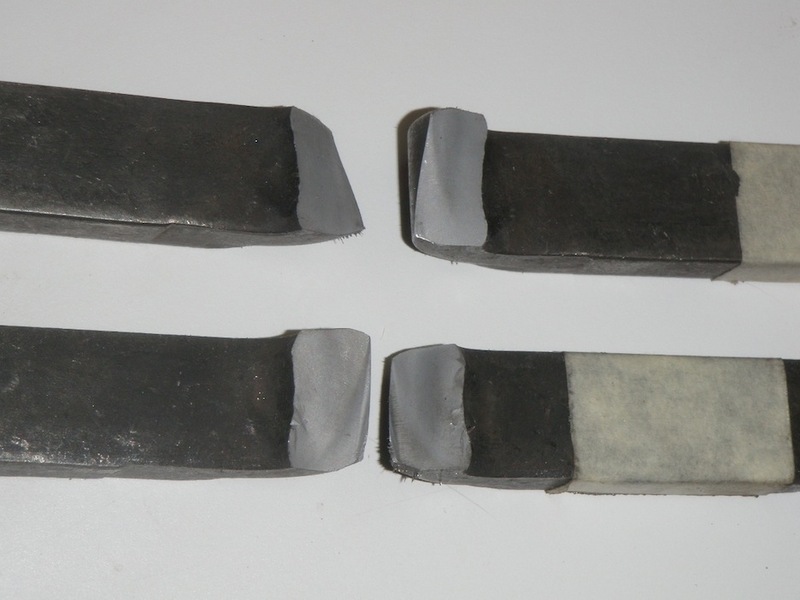 I received a full set of cleaned-up original magnet clamps from Lang's today, here is a picture comparing the originals to the current reproductions (which I obtained from Lang's earlier this year). To my eye, the repros are very similar to the originals, so the difference in performance must be due to the metallurgy and/or heat treat. In Frank's and Steve's pictures of magnets, I see "N" stamped on some legs, but that's all. In Andre's picture of his problem magneto, I see two valleys in each leg of each magnet, which look, for all I can tell, like wear points. And, the magnet to the left of the broken plate has the valleys going in the opposite direction, indicating that it was turned over at some point. My question is, what about those valleys? Are they normal? Or do they indicate something was rubbing on the magnets at some point in time? "...how and how hard should I strike my magnets to confirm that they aren't cracked prior to use? Just tap them on an anvil, like a tuning fork, or really whallop them?" Mark, I was advised (by Ron Patterson IIRC) to whack them HARD against a vise or similar. Which I did, holding them loosely in the Vee with gloves so as to not hurt my hand in the process. Ok, thanks, I have a full set plus four extras, so hopefully I'll still have enough for a full set after testing them all.